"Great value and takes the stress out of travel." 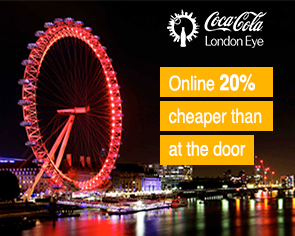 Find a wide and varied range of London tickets! From guided sightseeing tours and attractions such as Madame Tussauds, the London Eye and Harry Potter Warner Bros. Studio Tour, to sparkling musicals in the West End and football tickets! E-tickets to your inbox! See where the Harry Potter movie came alive on this behind the scenes tour. You will learn everything you always wanted to know about what went on behind the scenes and how these amazing films were made. Buy tickets to Harry Potter and Warner Bros. Studio Tour here! Plan your entire journey from home right through to London City. Buy your tickets from Gatwick Airport to Victoria Station before you leave home. Arrange your entire journey from home all the way to central London. Buy your tickets from Stansted Airport to Liverpool Street Station before you leave Ireland. Arrange your entire journey from home right through to London City. Buy your tickets from Heathrow Airport to Paddington Station before you leave home. Kensington Palace is a beautiful and newly refurbished Palace situated in the heart of London. Visit the King and Queens Apartments and the Palace Gardens. Book tickets for Kensington Palace in London here. The Tower of London offers the opportunity to see the Crown Jewels, Beefeaters, The Bloody Tower, and The Traitors Gate. Do not miss out on this central piece of London history. London sightseeing is best done with The Original Tour busses where you can hop-on and hop-off along any of the four lines and discover London at your leisure. Visit northern Europe's biggest church, St. Paul's Cathedral. Climb to the top of the famous dome and enjoy the view over London. See the tallest building in Western Europe. The View from the Shard will astound you. Most of London’s landmarks can be seen from here including the Tower of London and the London Eye. Buy tickets to View from the Shard here! Discover ancient Stonehenge just outside London. Enjoy an afternoon visiting Stonehenge where and get to explore this World Heritage site on your own. Buy tickets to Stonehenge in London here! See Windsor Castle, Stonehenge, and Oxford and explore these fascinating sights on this whole day tour. Come see some of England’s most amazing places. Buy tickets to Windsor Castle, Stonehenge, and Oxford here! Hampton Court Palace is situated just outside of London and is well worth a visit. See the beautiful gardens, the Maze and Henry’s Imperial Crown. Entrance tickets to Hampton Court Palace can be bought here!